Even you can make money online! Yes, it is true. There are many legitimate ways to earn extra cash and supplemental income online. Nowadays, anyone can do it. If you want to bring in some additional income to help with the household bills, save for a vacation or get yourself out of debt, there are many websites online to get you started. You don’t have to be highly experienced or have a long resume to work with any of these four websites to begin making money online. works with people from all over the United States to write very basic articles on a wide variety of topics. For instance, my first Textbroker article was on the topic of how to care for a mattress. I spent a few minutes finding a few articles online as my resource and quickly typed up the short article. Although Textbroker does have an application process, it is very light and almost everyone who can use proper grammar, lives in the US, and speaks English is quickly accepted. The greatest benefit of writing for Textbroker is their quick weekly pay to your PayPal account. has to be one of the coolest websites for making money online! Get paid to listen to a song and then write a brief review to give the artist your feedback. Although this gig doesn’t pay enough to count as a job, it is something you can do any time, day or night. Additionally, SliceThePie pays to your PayPal account a few days after you withdraw your funds (provided you have reached the minimum $10 cash-out threshold). There is no application process, just sign up and begin earning money. SliceThePie is a fun way to make some extra cash when you have a few spare moments through the day. is making a huge wave with freelancers online. Anyone can make money using Fiverr. Just create an account and begin thinking up things you can do virtually for five bucks! Whatever your specialty may be, from proofreading articles to giving tips about how to feed an iguana, there is no limit! You can also make things (like a pair of earrings) and sell for five bucks, just add an additional shipping cost that the buyer will be responsible for. Fiverr is afun way to make money, however, they do keep a portion of your earnings (everyone’s gotta make money). After Fiverr keps their portion and you pay your PayPal fees, you usually see around $3.77 per gig. So, keep that in mind when brainstorming the services you will offer at Fiverr. is a general transcription company that mostly deals with transcribing voice mail into text. It is a fun job, listening to other people’s phone’s voice messaging system and typing out what is said. Unfortunately, QuickTate doesn’t pay much for this work, but their application process is very simple and easy to pass. Many people use QuickTate as a way to gain some general transcription experience and ease their way into becoming a genuine freelance transcriptionist. Working online at QuickTate is a great way to hone your typing and listening skills. Anyone can make money online. 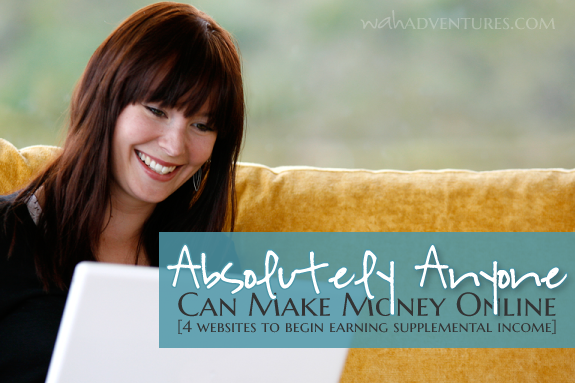 These are just four of many websites people often use to make a little extra cash or supplemental income. For more ways to make money online and even ways to work full time from home be sure to visit for home based job leads, reviews of companies offering work from home jobs, and tips or advice for surviving the online freelance world. Miranda Grimm- The creator of – has many passions in life. The Lord, her family, blogging and especially Web/Graphic Design. Miranda is living out her dream, working from home to be with her children while actually making money doing something she loves! Wow! Cool ideas! I’ve never heard of any of these except for Fiverr. I might check out SlicethePie… sounds like fun! What are your thoughts/experiences with Fiverr? I have never heard of textbroker before. I am pinning this to look into later. I love finding new ways to earn a bit of money here and there. I have used Task Rabbit in the past as well. Though it’s not all online it’s definitely worth it! I tried Slicethepie. It was fun at first and then I realized I have no musical vocab and my reviews weren’t descriptive enough. I’m not sure at what point but for me 5-10 minutes of my time was worth more than the 10 cents I was being paid. That’s a lot of reviews until the $10 cash out. I signed up for Textbroker, and the application process is pretty quick and easy, but their rate of pay for most articles wasn’t worth my time. We’re talking three to four cents a word. Not worth it when you’re spending time researching what they want you to write about and then actually doing the writing. I completely agree! I tried the content mill route thing for a little while but I felt like I was getting robbed. Three to four cents per word? You must have made it onto some teams with higher pay rates. A four star author only gets 1.4 cents per word. A 5 star author (very rare, reserved for professionals) gets 5 cents per word. Do I have to claim any of what I make from these sites? Uh, yes. Income is income no matter how you earn it. You’ll need to submit W-10s to them. I personally prefer Interact Media over Text Broker. For me, interact media provides an easier user experience. I also just stumble across another site that pays you to comment on blogs and forums. Postloop. They pay is pretty low though. I personally think if you are interested in freelance writing, applying to job boards is your absolute best bet. You can start out making $40 an article instead of the $2-$5 you get from content mills. Thanks so much for these tips! Postloop infected my computer with some crazy viruses that took extensive work to get rid of. Thanks for the heads up! I guess I won’t visit that one again. I will check out Interact Media. I was doing TextBroker for awhile but as someone else stated, I grew tired of spending time to write the best article I could only to be paid so little. What “job boards” are you talking about? CraigsList? Thank you very much for the information! Some great ideas here! Thanks for sharing. I am always looking for ways to earn a little extra income to help support our family. Regarding Textbroker, it’s not quite that easy. After you apply and they receive your paperwork, you write ten articles and then you’re put on hiatus until the editors review and rate your work. Then you can choose assignments from your ranking pool. If you get ranked a 2, there aren’t many assignments available. There are sometimes assignments available for 3 star authors, which pays $.01 per word. If you get ranked a 4, you get 1.4 cents per word. Five star authors are paid $.05 per word but there are very few authors ranked at the 5 level. Wow,you sound like you know a lot about things like this. I have a few questions. What do you think about e-book, can I make money write books online? I’m new to all of this,lol. oops…Crystal, can you delete for me? If websites that pay people to write articles are indeed telling them to simply take content from elsewhere and revise/rephrase it, then that raises some real red flags. I’m a teacher, and unless all sources are fully cited, this is basically payment for plagiarism. Can anyone who has worked for such a site put my mind at rest about this? I have a hard enough time getting students to understand that information on the web isn’t up for grabs and that using it is dishonest – if adults are being encouraged to do this to make a few bucks, then no wonder this is such a widespread practice! Textbroker is very strict on plagiarism and you can lose your writer account if you’re caught doing that. They don’t encourage it at all. All of their clients want unique content. However, sometimes it is necessary to go online and research something if you don’t know quite enough about the subject matter to put together a short piece, but they don’t want you to re-write anything — just original content. By the way, this is a great post! I use many of the sites mentioned (including Textbroker). Textbroker uses Copyscape to check for plagarism. You can’t even re-use your own content. So if you are writing ten articles with the same keywords for SEO on the same subject… say “How to Unclog a Kitchen Sink”, you can’t reuse what you just wrote. You have to write ten unique articles. Thanks! I signed up for textbroker, can’t wait to see how it works out. I would have to disagree with you when you said the application process for Quicktate is quick and easy. I signed up and filled out all of the information and even had personal references and I was all set except for when I did the typing test, I failed. There is no way to retake it. It isn’t like I am a terrible typist either! I am not sure what I messed up but anyways, I just wasted a few hours registering and taking the test and failing. Listened and reviews 3 songs. Took my time and wrote articulate reviews. Thought I received 50cents for first one, the I realized it was 1/2cent. Would have to listen and review 1000 songs to earn 50cents. Please please correct me if I am wrong………….. I can vouch for Fiverr– it’s great for getting freelance jobs as a graphic designer. Clixsense is pretty good too. It’s the same general concept as Swagbucks but it pays much quicker and it uses actual cash as currency, not points that you have to convert. I don’t know that Fiverr can also makes us money. Its a great help as a freelancer I would really appreciate your idea. Slice the pie is indeed the most fun way to earn some extra cash. This website provides gurantees for writers and many other advantages compared to other marketplaces. GREAT info. Thanks for posting! Do you know that the pay is for QuickTate? Great article. I think that participating in online surveys is also a great way to make money online. Great article. I think participating in online surveys is also a great way to make money online.